Forest Garden 6 x 8 Shiplap Dip Treated Apex Shed: This Forest Garden shiplap dip treated apex shed has a traditional style and feel to it and will give you plenty of storage space away from the house. This shed features a single door with stabilising double Z framing and secure hidden hinges and 2 polycarbonate glazed windows that will not discolour or go brittle over time. This wooden shed has a tongue and groove shiplap finish which is tight fitting to provide protection against wind and rain, it has a pressure treated durable boarded floor and an Innovative Onduline roof with no need for felting. This shed comes complete with a hasp and staple lock which you simply attach a padlock to enable you to protect your contents. To provide an attractive edge to this traditional apex roof shed it has a smooth planed finial and barge boards and being an apex shed it will look good in the garden no matter where it is positioned. An added feature of this shed is the Onduline roof which is a waterproof corrugated bituminous material with a number of advantages over conventional shed felt. This green sheet roof is very quick and easy to assemble, will not rust, rot or become brittle and it is lightweight and UV resistant. 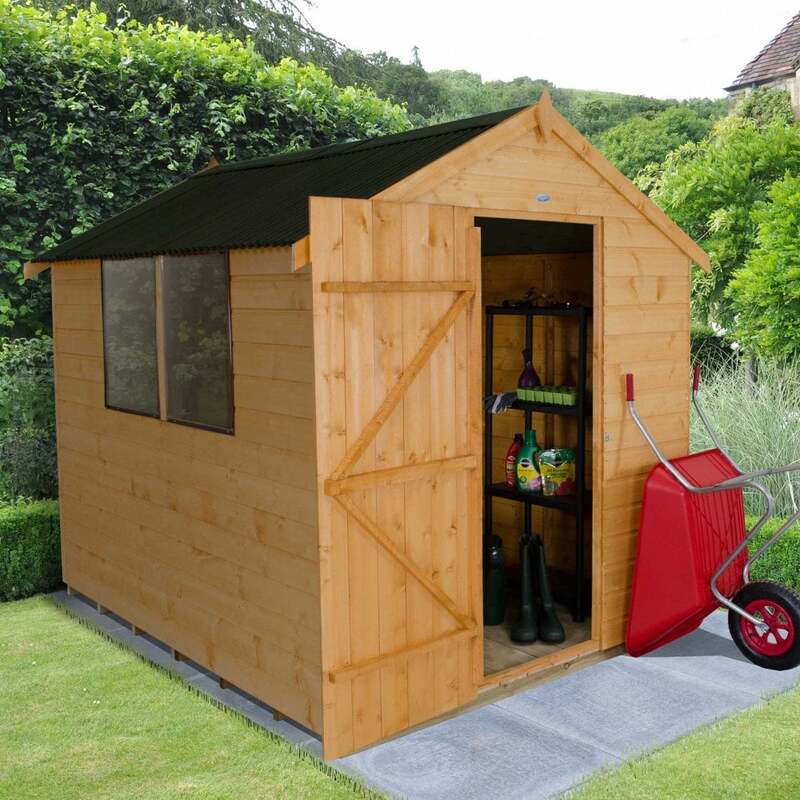 This shed has a 10 year guarantee against rot and is delivered in easy to handle sections which can be easily assembled with the included instructions.